You probably shouldn't quit your day job and try to become rich with the next Flappy Bird-like viral app store sensation. It's really tough to make money building mobile apps, VisionMobile Ltd. revealed in its latest developer economics survey. In fact, most app businesses aren't sustainable because they're not generating enough revenue, the research company said in its "Developer Economics Q3 2014: State of the Developer Nation" report released yesterday. The U.K.-based company surveyed more than 10,000 app developers worldwide to come up with the bleak financial outlook, along with interesting tidbits of information regarding the tools used, the OSes grabbing developer mind share and more. Half of all iOS developers and 64 percent of Android coders are below the "app poverty line," defined as $500 of revenue generated per app per month (in 2012, the company reported one-third of developers fell below this line). 24 percent of developers who are trying to make money actually make none. 23 percent make less than $100 per app per month. Only 1.6 percent of app developers earn more than $500,000 per month, generating many times the combined total earnings of the other developers. Not surprisingly, the most popular third-party tool category used by developers are ad networks. iOS leads the high-end market, with nearly twice as many (11 percent) iOS developers making more than $25,000 per app per month as do Android developers (6 percent). The survey also found that even though Android leads in developer mind share -- being targeted by 70 percent of respondents as compared to 51 percent targeting iOS -- Windows Phone was the only OS to actually gain mind share, coming in as the OS of choice for 28 percent of respondents. [Click on image for larger view.] Enterprise mobile app development is the next "gold rush." "Although Android and iOS lost developer mindshare, this was not fewer developers prioritizing either platform, rather more developers are now choosing sides," VisionMobile said. "The average number of platforms a developer targets has fallen from 2.9 to 2.2 over the last 12 months, with more than 40 percent only targeting a single platform." That somewhat belies the recent trend of new cross-development mobile app tools being continually announced. And while such third-party cross-platform tools are used by 23 percent of respondents, VisionMobile said 26 percent of those tool users only target a single platform. "By doing so, they get all the disadvantages without the main benefit," the company said. "They are among the lowest revenue earners of all tool users." 24 percent of mobile developers primarily create Android apps, compared with 17 percent who create native iOS apps. HTML5 is the most popular mobile app development language, listed by 42 percent of respondents, followed by Java (38 percent), C/C++ (26 percent), Objective-C (24 percent) and C# (23 percent). Globally, there are some 2.9 million mobile app developers who are creating more than 2 million apps. 67 percent of respondents are building consumer-oriented apps. 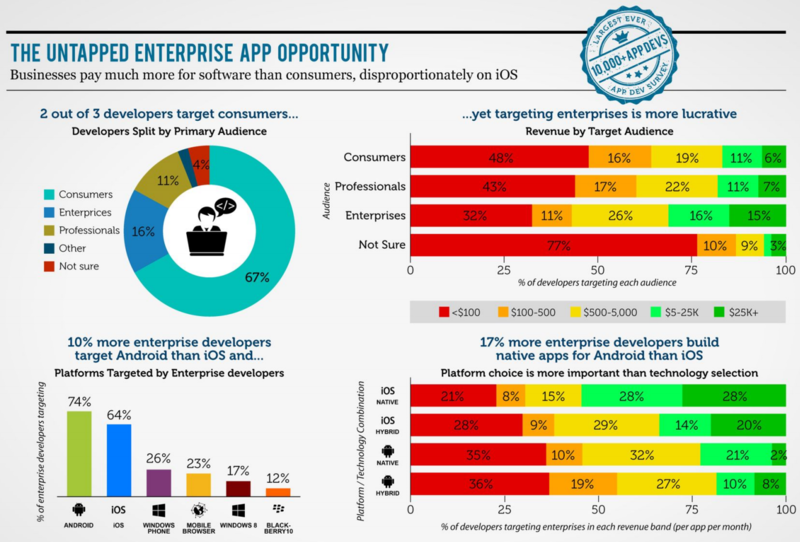 In the enterprise, 10 percent more developers target Android than do iOS. 33 percent of developers are building games. Unity dominates the game development tools market, being used by 47 percent of developers. After ad neworks, the most popular third-party tools are cloud computing (29 percent) and push notifications (24 percent). And despite the negative economic news, VisionMobile forecast a new "gold rush" in the making: enterprise apps. "Enterprise apps are already the safest bet in the app economy and they're only just getting started," VisionMobile said. 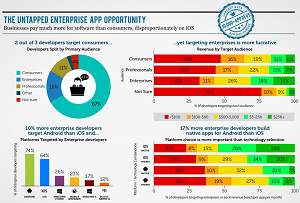 "67 percent of mobile app developers primarily target consumers and 11 percent target professionals directly. The 16 percent of developers who target enterprises are twice as likely to be earning over $5,000 per app per month and almost three times as likely to earn more than $25,000 per app per month." The company concluded that recent enterprise app initiatives by Microsoft, Apple and Google "will undoubtedly drive greater adoption of mobile technology in enterprises and create countless opportunities for developers to help rethink the way we work." The report is available for free download after registration.